Everyone’s welcome: Fr Ron Mollison and his parishioners strive to be a welcoming community at All Saints’ Parish, Albany Creek. WHEN he’s not in church or busy around his parish, there’s every chance you might find Fr Ron Mollison tinkering with a car, or just going for a drive. More specifically, he loves design – looking at how things are designed, and designing things himself. He finds it so engrossing, he says he may have become an engineer, or maybe an architect, had he not chosen priesthood. “Design interests me – design of many things …,” Fr Ron said. Leading a busy parish like All Saints’, Albany Creek, in Brisbane’s sprawling northern suburbs, he doesn’t find much time for indulging his special interest but, when he does, he said “I muck around with cars a bit”. Fr Ron’s in his golden year of priesthood, having celebrated his 50th anniversary of ordination on June 29 and, at 79, he’s nearing the end of his days of full-time ministry. When retirement does come, he has an old MG sedan and a 1935 Studebaker waiting in his garage for attention. At the moment, he finds working with the cars “time-consuming”. “And it’s getting increasingly expensive …,” he said. “They’re increasingly getting their prices and telephone numbers muddled up,” he said with his typical dry wit. The parish priest loves working on the cars but these days it’s a case of “they’re sitting there; I’m looking at them”. In restoring the cars, he said, he liked to “fabricate bits and pieces if need be”. “I do a bit of welding but I’m increasingly unable to do that because my eyesight’s deteriorating now and you’ve got to have good eyesight to do welding,” he said. Fr Ron’s always had an interest in cars “and just acquired a few skills – got various fellows to teach me welding but I’m not much good anymore”. He said working with cars had been a good pastime for him away from the busyness of parish life. “You could lose yourself in it …,” he said. He said he missed it, “so I listen to music”. And what sort of music? “Just about everything, except punk rock,” he said. Concerts are no longer an option because he’s “at the stage where I like to be in bed about nine o’clock”. “Maybe when I’m on holidays I might go to a concert if there are any available,” he said. “I went to the (Brisbane) Jazz Club one night when I was on holidays (recently), and that was good. Fr Ron’s motoring interests extend to car racing, and he’s even taken to the track. He’s driven at the annual Leyburn Historic Sprints on the Darling Downs. “I’ve raced up there … five to 10 years ago,” he said. “I won’t do it anymore; my vision’s not good enough. “You’ve got to have good sight for race driving, so I won’t do it anymore. He had no thought of glory, just fun. “I just enjoyed it. I don’t have a consuming desire to win; I want to enjoy the driving,” Fr Ron said. He has a similar attitude as a humble parish servant. 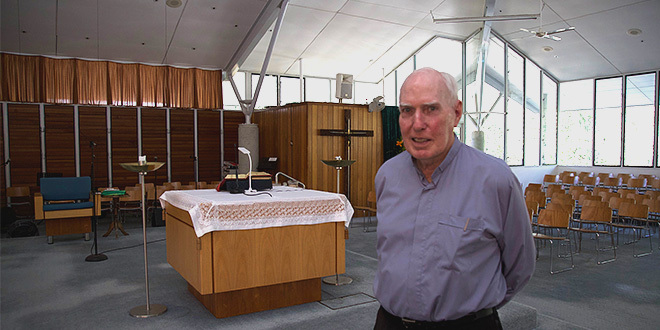 Apart from eight years as chaplain at Greenslopes Repatriation Hospital and a year on the staff at St Stephen’s Cathedral when he was private secretary to Archbishop Francis Rush, Fr Ron has ministered in Laidley, Windsor, Salisbury, and Inala parishes, before coming to the new Albany Creek parish in 1986. “I’ve been here ever since – thirty-two years,” he said. Under his leadership All Saints’ has flourished into a vibrant, lively parish with many and varied ministries. Fr Ron said the parish had worked hard at building community and making sure that everything it did, it did well – whether in liturgy, in being welcoming, in music ministry, in sacramental preparation or whatever. “It’s not just building faith, as important as that is, but building community too is an important element of it here,” he said. “If people are faith-filled, well, that’s wonderful but if they all do it in isolation, it doesn’t move mountains. “It’s that striving, the constant striving (to do things well and to improve), I think … You don’t give up. Fr Ron’s overdue for retirement but soldiering on. “Well, I’ve still got reasonable health,” he said. “If I was unwell, it would be a different story. “If I was so old that I was non compos mentis (of unsound mind), it might be a different story, but I think I’m mildly with it. “I’m quite happy to continue for a while, a year or so perhaps. Fr Ron has worked hard on leading people to deeper faith by reaching them through his homilies and building community. One of the most rewarding things for him as a priest is “every now and then I can produce a good homily – not frequently, but I try to; you can pull that off”. “That’s satisfying, but it’s not looking for satisfaction or victory or whatever, but it is a bit consoling if you can think, ‘Oh, well, that’s not too bad’,” he said. The big challenge, Fr Ron said, was “to make practical application of the Scripture readings”. “It might be interesting to know what they thought of in antiquity but it’s what people think of now on how it can form their life and shape it,” he said. Fr Ron was being modest in saying he could produce a good homily only “every now and then”. Anne Frawley-Mangan, a parishioner who works closely with him, especially in sacramental preparation, said he “gives great homilies”. “He always says his homilies are Z-graders (but) he gives good practical homilies with a bit of historical background on the Scripture and then applies it to life today,” Mrs Frawley-Mangan said. She affirmed Fr Ron’s efforts at building community too. “I always call him the Enabler,” she said. “He recognises the gifts and strengths in people and then he enables them to build up the community and the Church. “We just love him – that’s the bottom line. “Everybody’s welcome here and that starts from the top. “It starts with (Fr Ron) and flows to the rest of us. “He’s so, so very loved.